Review: Superman -- the planet Krypton. Young Sherlock Holmes -- an English schoolboy. James Bond -- it’s our turn to find out about him. We can see how he grew up in the new, thrilling novel series by Charlie Higson. 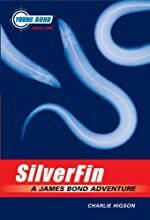 The first in the “Young Bond” series is Silverfin, a novel beautifully introducing the character James Bond, the action hero from the movies. He is the hero of the story, even at the age of 13. Taking place in 1933, the book has historical notations too. All 335 pages are great! The novel is divided into three parts, and a prologue opens up the story. “The face, not human, but that of an eel rose above the water and …” It tells of a boy fishing in a lake, and being attacked by eels. The first part tells of James’ experiences at Eton, the school he is transferred to after the death of his parents. Eton is an all boys’ school in London. He meets some new friends, such as an Indian boy named Pritpal. After making a few friends, he meets an old colleague of his father, the father of a bully, George Hellebore, two years older than James. This American bully’s father, Randolph is a major source of funds to the school, and a suspicious character. In a race designed by the father, James takes on the bully with shocking results. The next part tells the readers about James’ return to his aunt and uncle’s house in Scotland. On the way, he meets a red-headed boy named Kelly who plays a huge role later in the novel. Kelly’s cousin has disappeared, and he suspects foul play. They become friends, realizing they are traveling to almost the same place. George, the bully is also on their train and stirs up trouble here too! Randolph owns a large castle near James’ family home. The arrival and stories from the house are enjoyable, characterized by an Aston Martin, fishing, and great foreign food. The third part, the action scenes really characterize the book as that of James Bond. Our hero with his new side-kick Kelly decides to break into the castle, in which they deduce Kelly’s cousin must be hidden. They choose to break in, and the action scenes really intensify. Eels, a body enhancing formula and the death of a few characters really impart a sense of thrill to the novel. Reading the book was a truly intense feeling. The action was tight, and I loved the comparison to the James Bond movies we have come to love. It was a very intriguing book to read, and I could not put it down, reading the entire 335 pages in one night. However, I caution the faint hearted, or those who faint at a drop of blood, for the descriptions in the book can get a bit brutal. I also had a difficulty believing a few parts. An unbelievable escape scene made my feeling for the novel fade a bit, but I quickly found the next few scenes great. Nominated for a 2005 Edgar Allen Poe award, the book has received some of the honor I think it deserves. I, however think it deserves more recognition, as I found it intriguing, interesting and an all-over great book, and I would recommend it to almost anyone. Review written by Jennifer, Grade 8. Date of review: April 2009.